photo: Imam Arun Polozani of Albanian-American Cultural Center in Riverdale, NJ, expressed support for bakers at the Mondelez Nabisco Fair Lawn plant. Rich Nazzaro remembers when he started at the Fair Lawn, New Jersey Nabisco bakery. “I said this is great, I’m making the iconic brand of Oreo,” Nazzaro shared at a field hearing Interfaith Worker Justice conducted September 6 at the request of his union, the Bakers Confectioners, Tobacco, and Grain Millers international union. 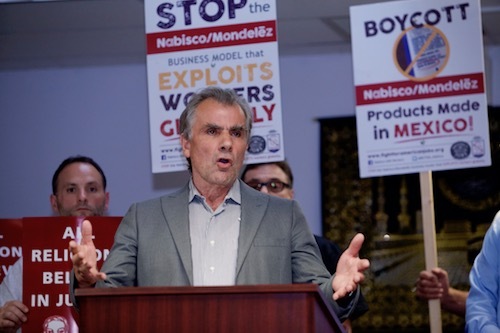 He and others at the hearing, which was preceded by a news conference led by interfaith leaders announcing the hearing, shared concerns that Mondelez might cut costs all the way into bankruptcy if they continue to cut the costs for labor and ingredients. “I remember how proud I was making the iconic brand of Oreo and now the product that they’re using to make it, the taste of the cookie--now I’m not so proud to make it anymore,” Nazzaro said. He was joined at the hearing by a dozen others who talked about their experiences. The news conference and hearing were the second set of events in a seven-city tour that kicked off in Chicago will also include Portland, OR; Richmond, VA; Atlanta, GA; Salinas, Mexico, and Washington, DC. Read more about the issue at the Bakers Union campaign site, fightforamericanjobs.org and check out full video from our news conferences at the IWJ Facebook page.